New version of Rescue Kit-iPhone app, developed by Sarsoft, has been released for iPhone, iPad and Pod touch. Rescue Kit 2.0 is the best way for the users to handle in crisis situations. The director of Sarsoft, Jindrich Sarson decided to create this app after he faced an accident in a village. It was hard to explain the unknown location to 911 operator. So the idea came and the decision was made and today we received a “survivor” app that helps in any emergency. 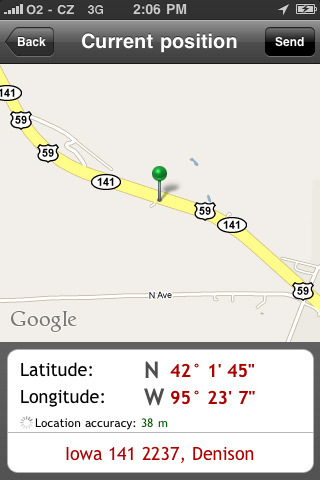 With Rescue Kit 2.0 you can send current location by SMS or email, and can signal SOS. The updated version includes database of emergency numbers from all countries over the word like ambulance, fire department, police or so on. When app is started, the current location of the user is displayed in detail: latitude, longitude and map of the location as well. Exact GPS location is always welcomed by emergency operators and when serious accident happens, it can even save the life. This is extremely helpful, when calling for emergency help. Rescue Kit 2.0 is only $1.99 (USD), and available worldwide exclusively through the App Store in the Travel category.